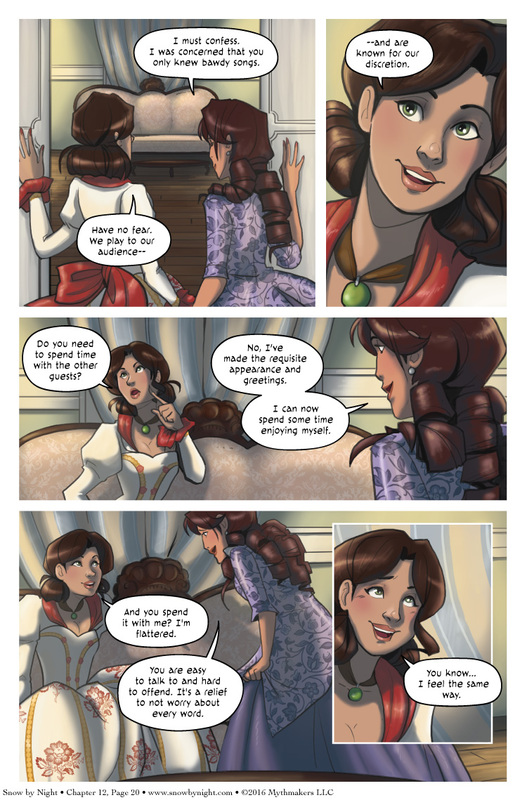 Jacqi and Mathilde form a friendship that crosses class boundaries on Chapter 12, Page 20. This may seem like not a big deal to us, but in class-conscious Saronne, it’s a big deal. The stay at the ball is only a brief respite. We return to Jassart on the next page. To see a preview of what is about to befall him, please vote for Snow by Night on Top Web Comics. I’m working on the script for Chapter 13, which I’ve titled Water Flows Down. I have a bit of post-party business to wrap up and then we’re back to Blaise and Snow-by-Night. To play off of Game of Thrones — Spring is coming. And please tell me you are using some clever software to draw the detail on those dresses and not drawing all those little flowers by hand. Naty hand draws the design and then uses clever software to duplicate it as needed. Photoshop is really good with warping and shaping the design to make it look like it follows the folds of the fabric. Oh just kiss her already! While I think Mati and Jacq make a lovely and elegant couple, I hope Mathilde isn’t just manipulating Jacqui in order to keep tabs on Jassart or somesuch. I mean, I love both of these ladies as characters, and I think they’d make an awesome couple and delightful partners-in-crime (sort of a fighter and bard/rogue partnership archetype), plus I’m a huge sucker for well-written courtly courtship between ladies. But I worry that Mathilde has an ulterior motive that could potentially hurt Jacqi if things go wrong. I think you might be right, Mathi could just be using Jacqi to spy on Jassart. And if her spying clears Blaise’s name, I might over look the fact she could be crushing someone’s heart. Emphasize on might. This episode, on “Vote Bait”: Ominous Foreshadowing.